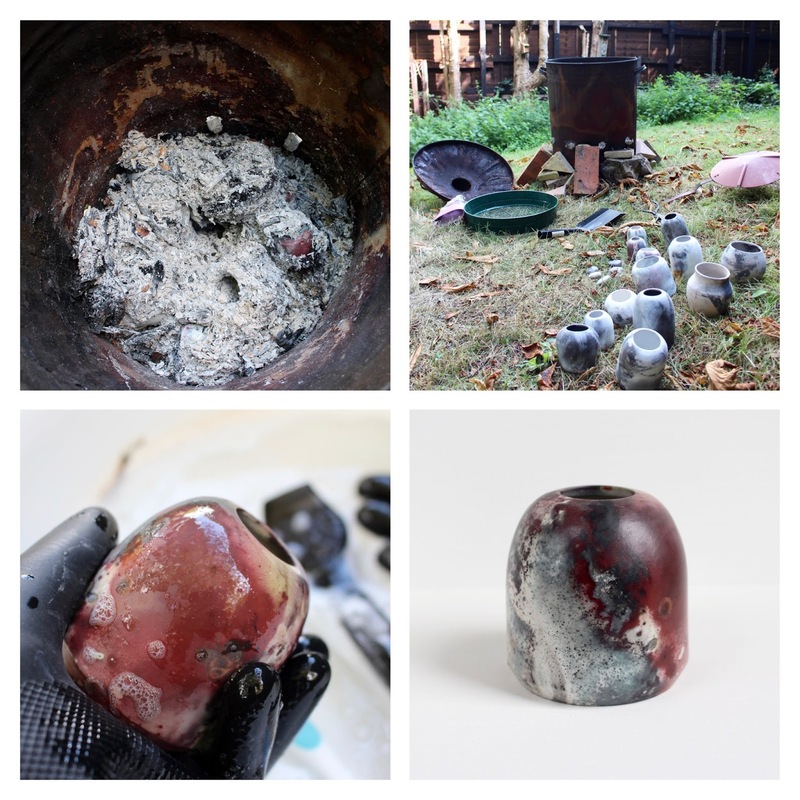 One of my most popular posts on this blog has been the one about how to make a wood ash glaze. It seems there's quite a few potters out there looking for information on this. So I thought I'd do an update in case anyone finds it useful or interesting! 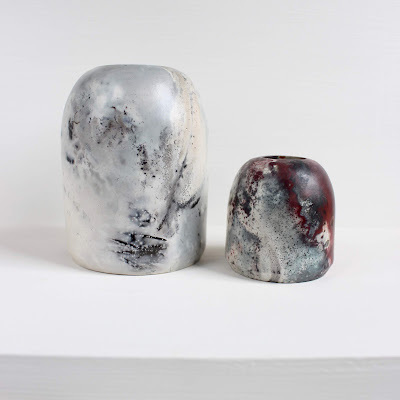 I've completely run out of my first ash glaze - the one I made back in 2013. 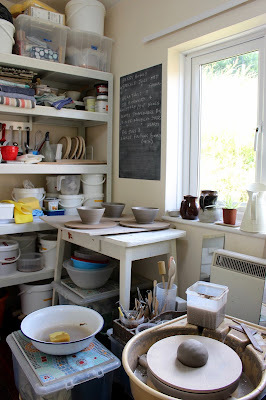 It was such a lovely glaze I used it on lots of pots. Since then I've moved house and now have a garden with mature trees which are always dropping branches. 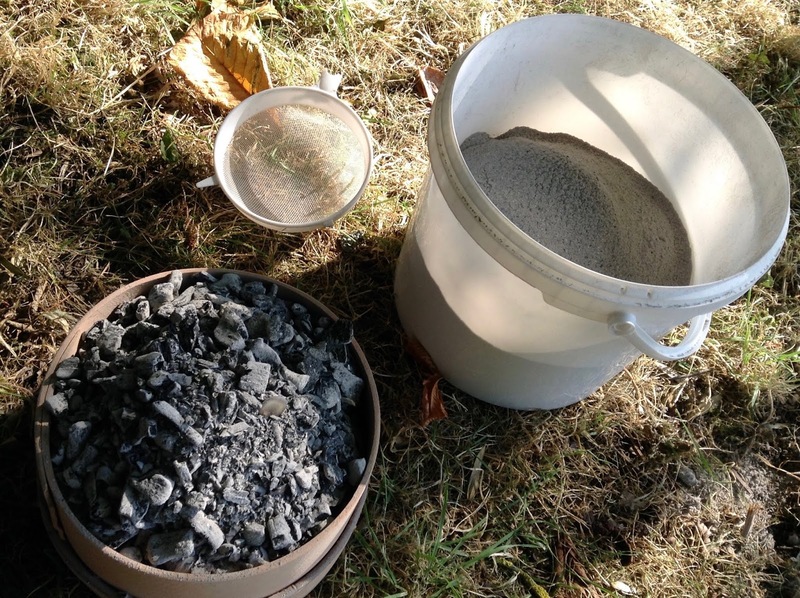 So I've got plenty of opportunities to gather wood ash from fires. 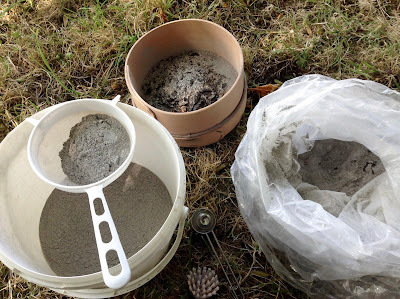 I now have 2 bags of ash from the last 2 years of collecting. I don't separate the wood types when burning because it would take too long to gather enough ash. So the ash I've collected is a mixture of lots of different wood types including Ash, Chestnut, Apple, Oak, Damson and Hazel. We've also got a wood burning stove, so there's a mixture of 'shop bought' logs in there too. Last time I posted about ash glazes I showed the glazing part. But this time I thought I'd do an update showing the ash sorting process. It's pretty simple really. Get your 'white' ash from a fire. It will have bits in it (leaves, twigs, charcoal etc). Then I use a normal kitchen-type sieve to separate the lumpy stuff from the white ash. At first I used a brush to help pass the ash through, but this was pushing bigger pieces past the mesh which I didn't want. So in the end I just tapped the sieve repeatedly on the side of the bucket and this was enough to shake it all through. And that's it! No mystery. It does take a while to do though...at least a couple of hours just to sort through two buckets. These photos were actually taken back in July on a very hot day. Sorting ash is a messy business so I sat in the garden in the shade under the trees wearing a mask and goggles and tried to avoid breathing in dust! 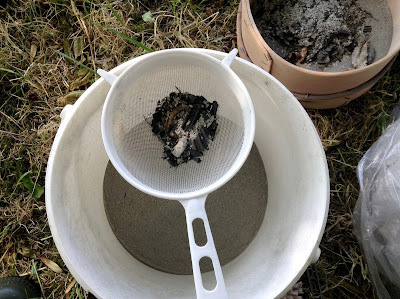 The first bucket of ash had hardly any debris because it came from outdoor firings (lots of leaves, twigs and cardboard burned). 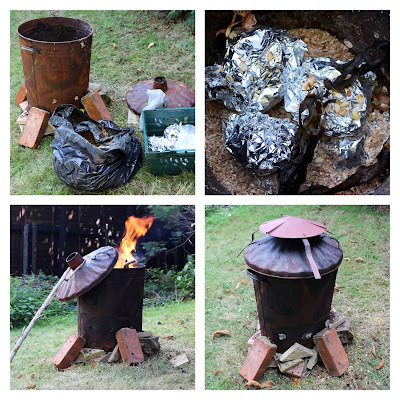 But the second bucket had lots of charcoal pieces left over from the wood burner - as you can see in the photo below. I've also kept the charcoal separately because it still had plenty of fuel left in it and I intended to use that for something else - which I will post about another time! And you might notice I also broke my sieve doing this bucket! 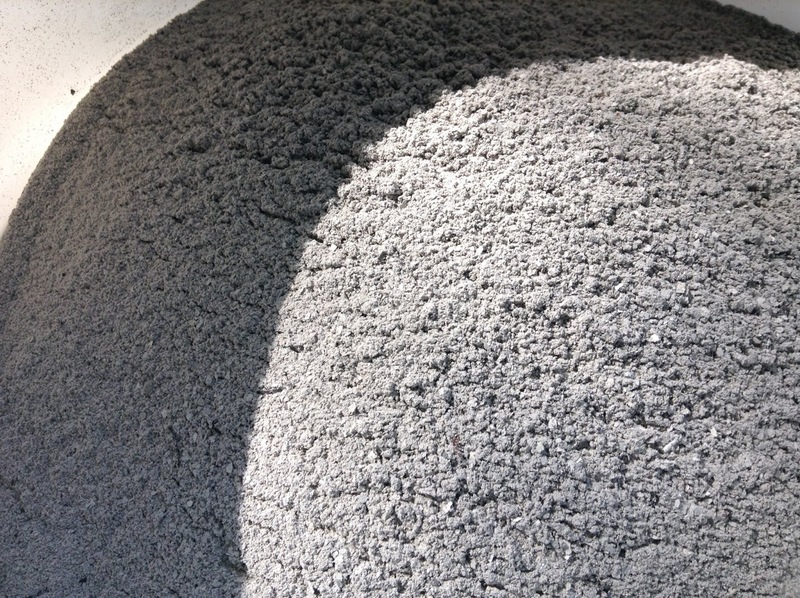 As you can see from the photo below, the end result is quite a uniform fine grey/white ash. And this is what I use as a dry ingredient in a wood ash recipe. 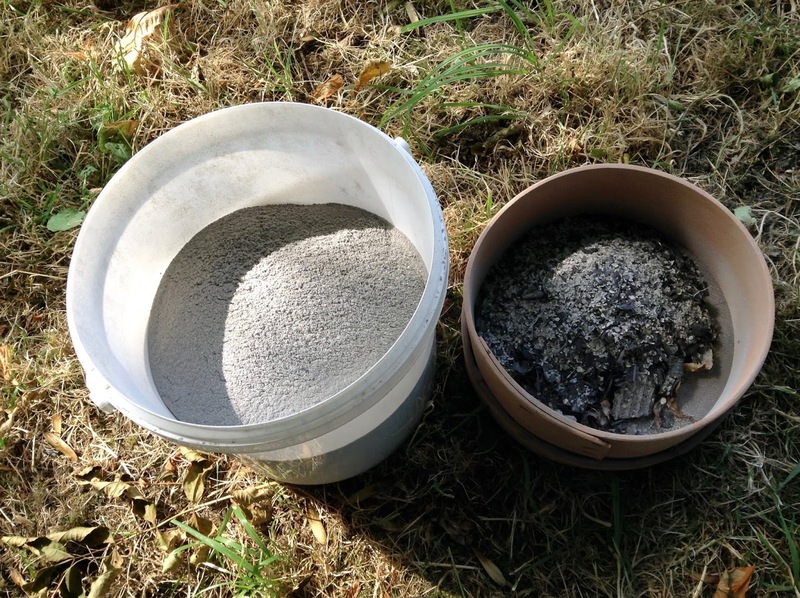 I don't bother washing the ash because it seems to work fine without. (This might be because it's a mixture of wood types rather than just one.) 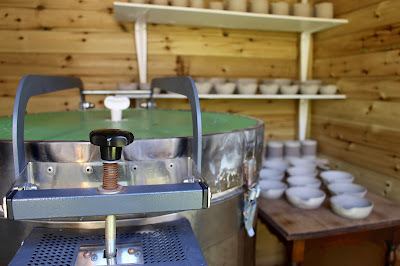 I then use a 60 mesh to sieve the glaze. I usually don't use a finer mesh than this because I feel it takes out some of the 'material' that makes the glaze unique. I've also made a couple of glaze recipe tests. The top tile test is the same recipe as the one from my original post. But it's a bit dry and matte this time around. So I think I'm going to try it again with a percentage of iron oxide - this might loosen it up a bit and make it more glossy. That's my guess anyway! 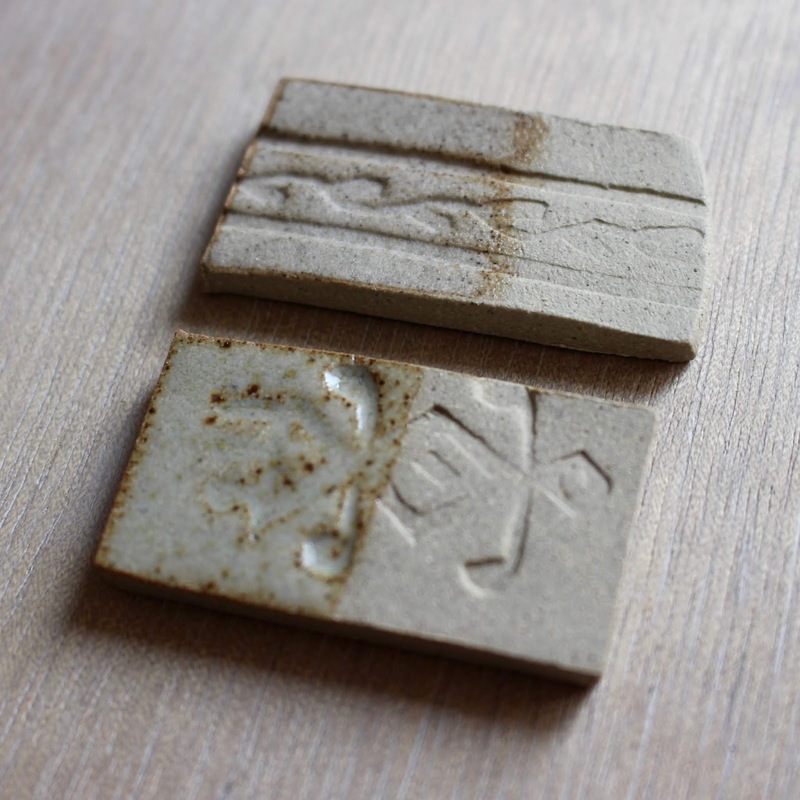 But the bottom tile I really like. It's a recipe from Emmanuel Cooper's The Potter's Book of Glaze Recipes 181 page 102. A lovely pale green with a fleck. So I'm going to make a batch of this and try it out on some pots. I'm looking forward to seeing how they turn out! Anyway, I hope you enjoyed that - and it might have been interesting or useful to someone! Thanks for reading! Ah, the ubiquitous chalkboard! In my day we called them blackboards, but I suppose that reminds people too much of school. 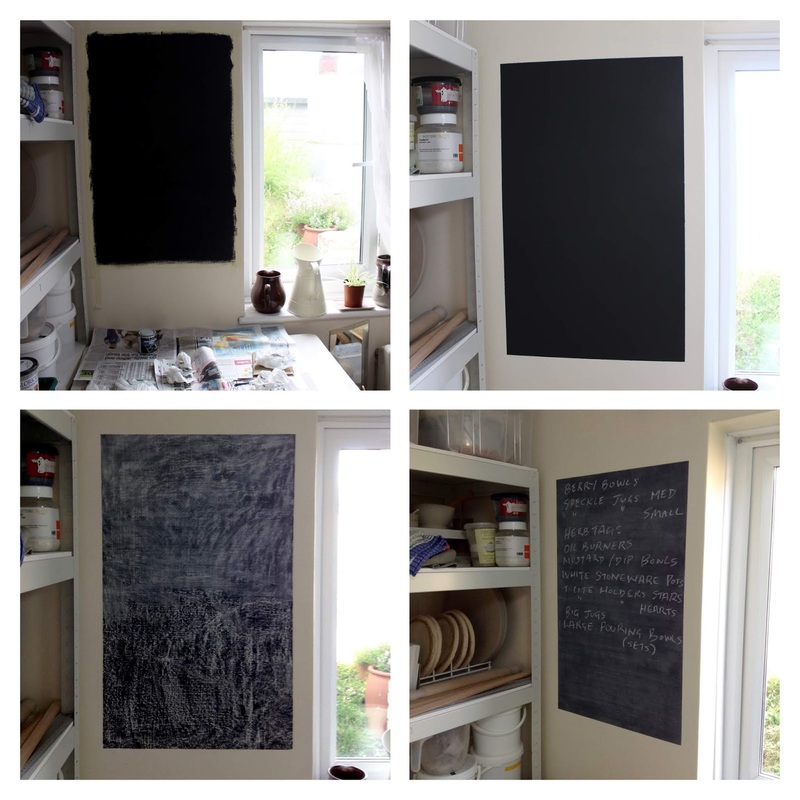 So chalkboard it is! 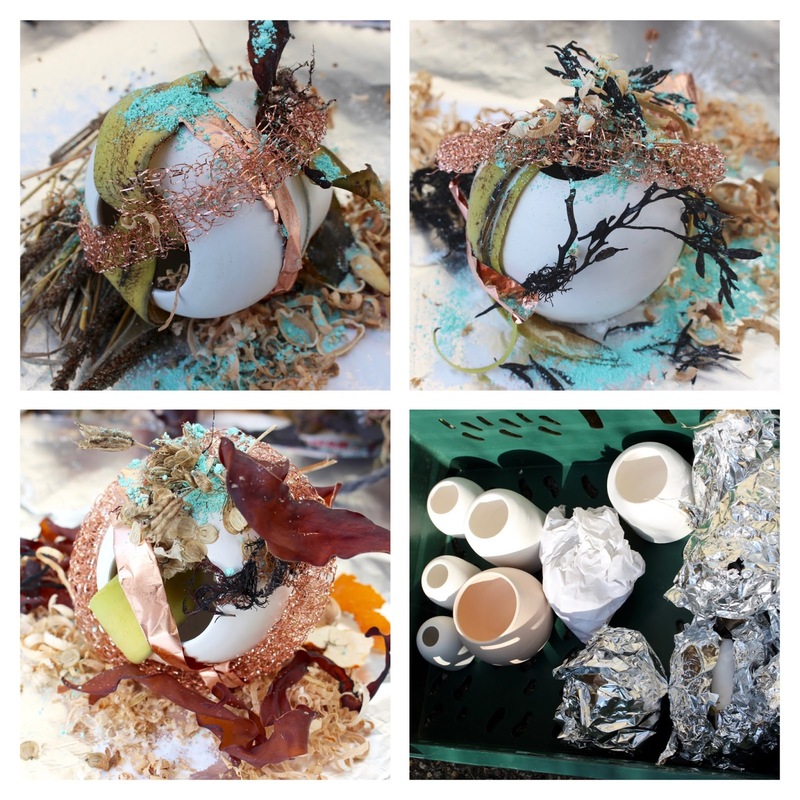 Ever since my old notice board (a pin and cork affair) fell off the wall onto a batch of freshly thrown jugs (yes, that really did happen) I've been thinking about an alternative system. The obvious choice is a trendy chalkboard - although I'm not sure being trendy is necessary in a studio. 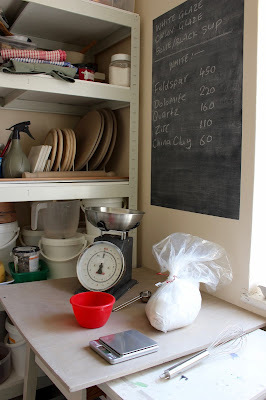 But being functional is, and applying chalkboard paint straight onto the wall at least guarantees that nothing can now fall on any freshly made pots. Unless of course it's chalk. But as all potters know, chalk is essentially Whiting (a glaze ingredient) so I'm not too worried about the odd bit of chalk dust sprinkling around the studio. I actually enjoyed making this chalkboard. 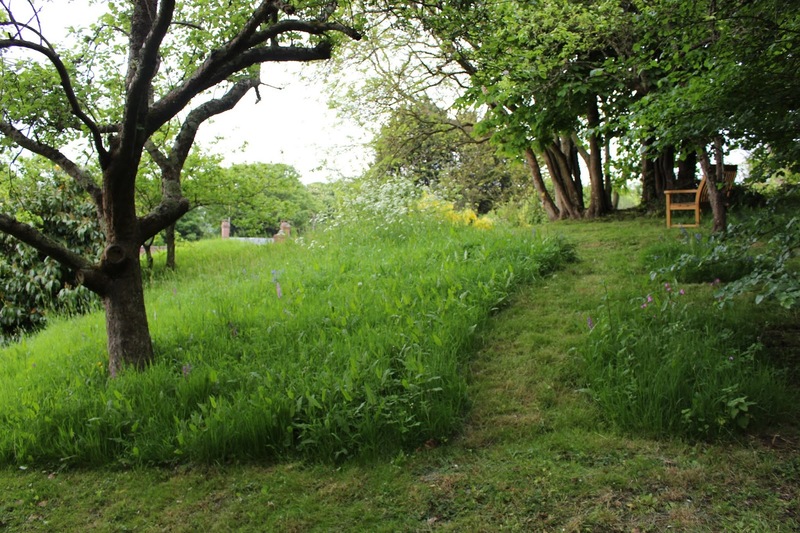 It's very easy to do - just a bit of masking tape to mark the area. I used a brush instead of a roller because it's quicker to just open the tin and go. I used two coats and you can see all the stages in the composite photo above. Peeling the masking tape off at the end was hugely satisfying too. Anyway, I recommend one of these if you have a studio that needs a space for writing short messages to yourself that are constantly changing. Below you can see I'm using it to start making up a glaze - the recipe is on the board above and can be wiped out as each ingredient goes in. Perfect for keeping track. 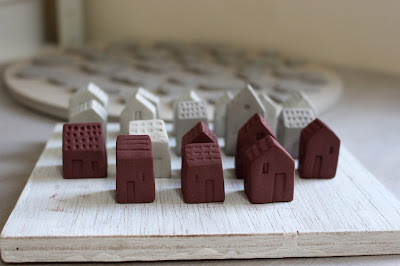 This Week I Will Be Mostly...Glazing. 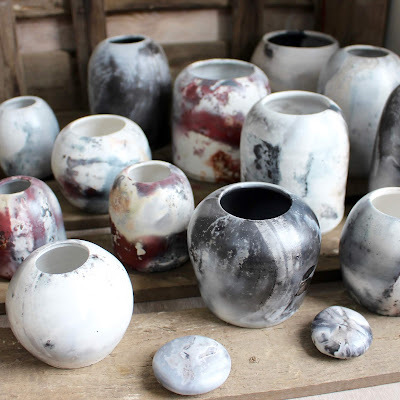 This week it's all about glazing. 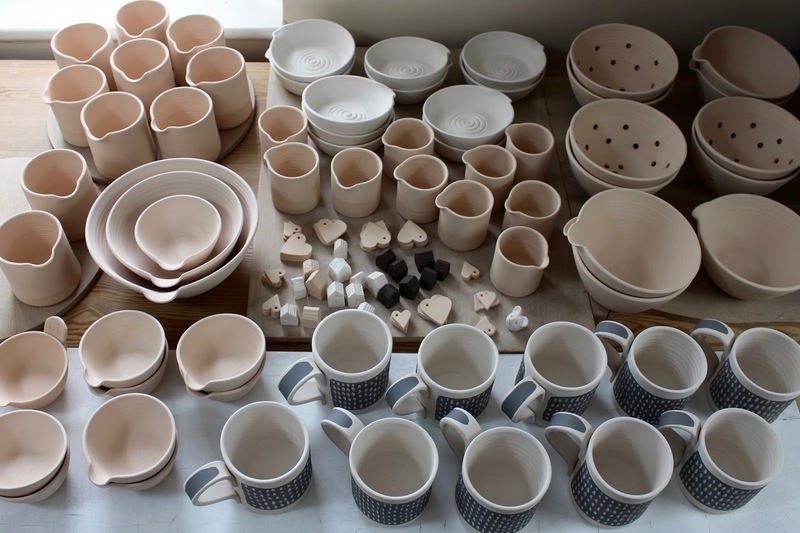 In fact I have plenty of glazing to do because I have enough bisque fired pots to fire two glaze kilns (which I plan to fire next week - all being well of course). 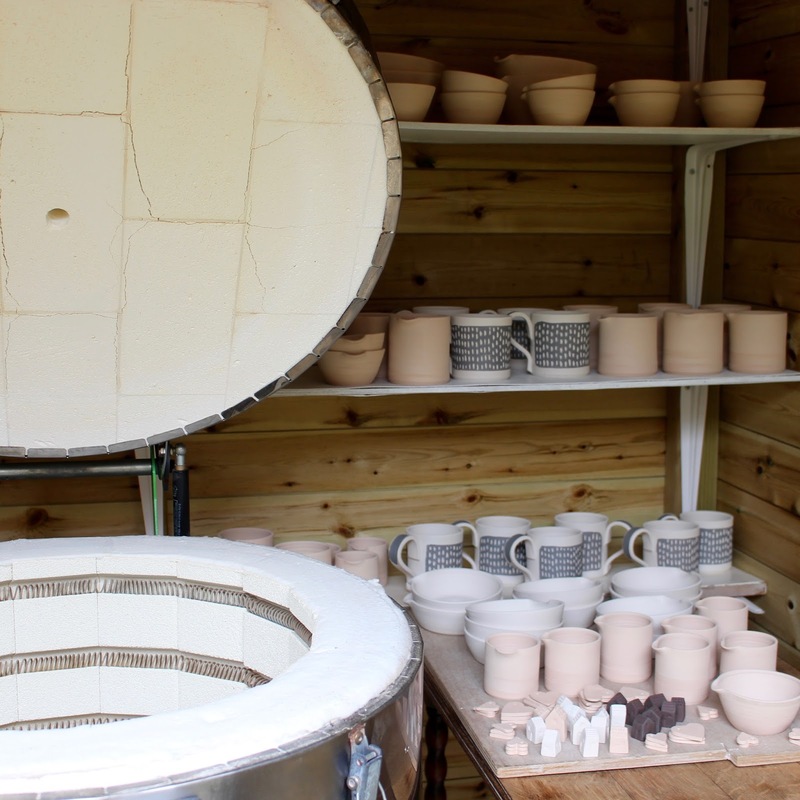 In the photo above you can see the kiln shed as it was a week or so ago -with pots waiting to be fired in the bisque kiln. And below are a few last minute shelf fillers - some tiny stoneware cottages, in a mixture of stoneware and black clays. 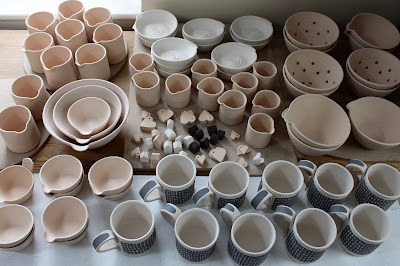 After I fire a kiln I always leave it to cool for a whole day in between. This makes sure all the pots are cooled down to 'room temperature' before I crack it open. Even so, they can still ping with the temperature change and make noises! I cracked this bisque kiln open last Friday: and below shows the kiln shed after I've opened and unpacked everything. 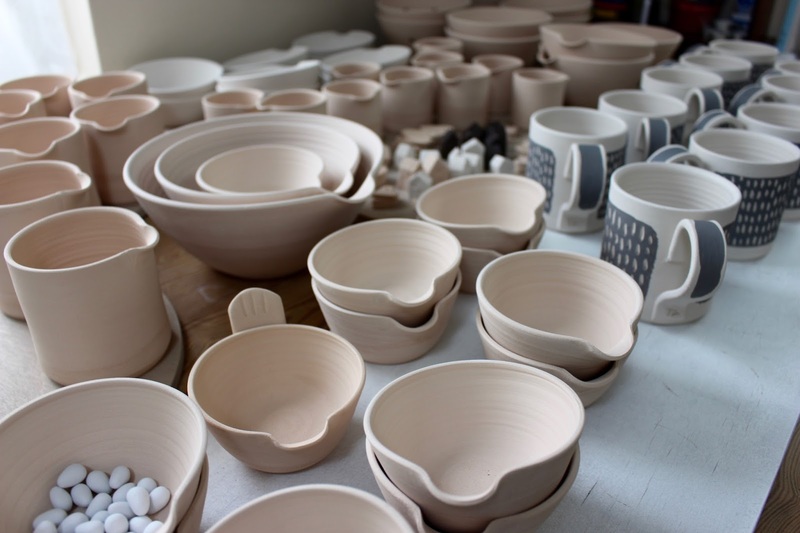 You can pack more pots into a bisque firing than into a glaze. 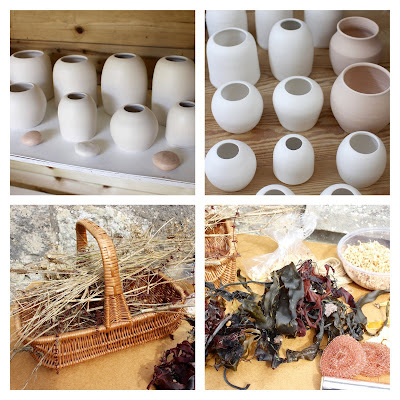 In a bisque kiln the pots can touch each other and be stacked, but in a glaze they can't. So I already had some 'spare' bisque fired pots left over from the last firing. And this is why I've got two glaze kiln's worth of pots to glaze this week. As you can see in the photo above and below there's a variety of small batches here. 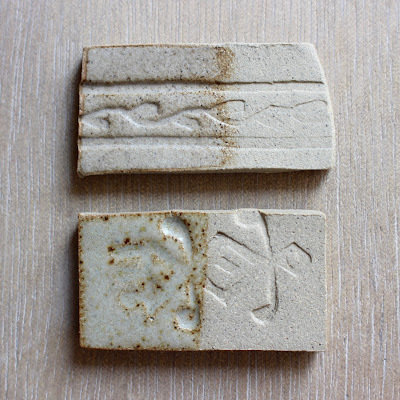 I've discovered that small batching in this way makes the best economical use of my kiln. Over time you get to know how many pots will fit onto each shelf and in what combinations. Even so, I still scribble a small 'floor plan' of each kiln shelf for each glaze kiln just to make sure everything will fit. There's nothing worse than having a couple of glazed pots left over which you can't fit in!